Suitengu Shrine in Kurume, Fukuoka is the main shrine of all Suitengu shrines in Japan, particularly famous as the deity of safe and easy births. Celebrate the process of life, and prepare for the most profound moments of joy through an Anzan Kigan ritual for birth. 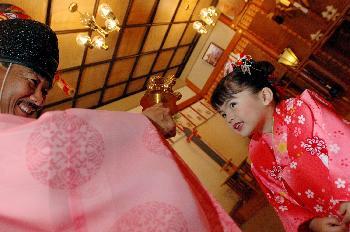 Hatsumiya Mairi is an ancient tradition for those who have been blessed with the miracle of a child. It is a special ritual that allows the new parents to convey appreciation to the kami for the birth of their child and to express heir wishes for the child to become good natured, kind hearted, true of spirit, respectful of all around and lead to their inner strengths to find their own path in life. Male infants usually visit a shrine on the 31st day after birth and girls on the 33rd day after birth. However, since an infant's immune system is delicate, it is best to consult with your physician as to when your baby is able to venture outside of the home. Shichigosan is a traditional event celebrated by 3 and 5 year old boys and 3 and 7 year old girls. During Autumn, children dressed in kimono visit a shrine to report their healthy development and to receive divine blessings. It is said to have originated from the ancient rites of passage for children such as Kamioki or growing of hair, Hakamagi or wearing of hakama for boys and Obitoki or the use of Obi for girls. culturally exciting. Reservations are accepted from September 1. Please refer to the Shichigosan/Jusan Mairi Page for details and Reservation forms. Special blessing to affirm the emotional, psychological and physical changes challenging 13 year-old boys and girls. A ceremony to empower one through the many significant changes and transitions of becoming an adult and celebrating new beginnings of discovering your life path. In Shinto, there are many passages of later life and rituals that support and guide people through the spiritual dimensions of those passages. Kanreki is observed at the completion of the zodiac cycle and is a joyous occasion which celebrates the beginning of a new cycle and evaluation of the meaning and purpose of one's life. Koki originated from a famous Chinese poem by Tu Fu which expresses how rare it was for people to live until 70. It is also a time for a new focus in life - to see the value, quality and meaning of our lives even in the face of illness or declining physical or cognitive capacity. It also expresses how we should cherish and embrace this new chapter in our lives. The kanji characters for Ki means happiness and is written using the characters for seven, ten, seven or 77. Ju means longevity. birthday". Again, ju means longevity. The House Blessing is a ceremony that brings positive, clear energy into the home. The home is a very important aspect in our lives - it means security and well-being and is often treated like a living object as it needs to be taken care of and loved to sustain the harmony of the home life. The House Blessing aims to "feed" the house, show proper treatment and respect to it to create a sense of peace, balance and harmony. New Business Blessings set the foundation of positive energies, harmony, prosperity and success. Starting a new business is very much like the birth of a child, it is the child of your mind and creativity. As a milestone, it is particularly important to clear and bless the business and its location in the beginning to set your original intention and to open itself to infinite new opportunities, new connections and success.